UPDATE | The city attorney’s office confirmed yesterday the language of a proposed rent control measure in Long Beach, finally allowing housing advocates to begin a signature-gathering process. Officially titled “Long Beach Rent Control Ordinance,” the measure would establish residential rent control and “just cause for eviction” requirements in the city. It was co-sponsored by Housing Long Beach and the Long Beach Gray Panthers who filed paperwork for the initiative in November. 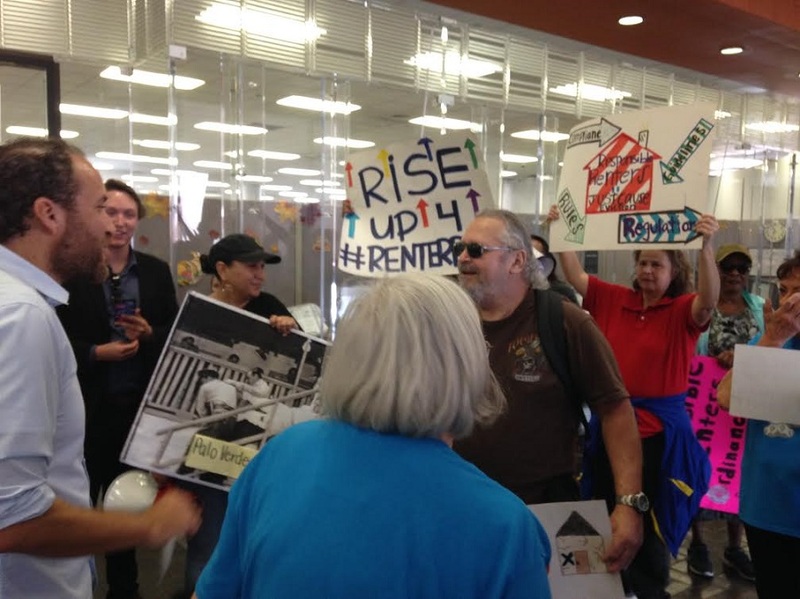 Since their efforts were announced Pacific West Association of Realtors (PWR) and Apartment Association, California Southern Cities (AACSC) released statements opposing rent control while at the same time praising the mayor and the entire city council’s opposition to rent control. The #RentControlNOW Coalition is scheduled to have a campaign kick-off at MacArthur Park at noon on Sunday, February 11. MacArthur Park is located at 1321 East Anaheim Street. 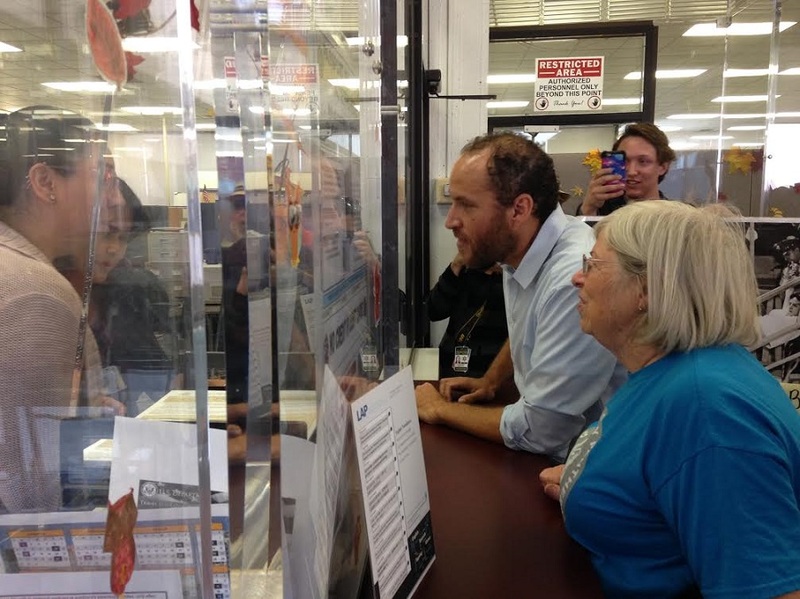 Housing Long Beach Executive Director Josh Butler and Long Beach Gray Panthers Secretary Karen Reside submit papers to begin a rent control ballot initiative. Photos by Stephanie Rivera. 11/9/17 at 6:00PM | Housing advocates are working fast to re-submit a petition to get a rent control measure on next year’s ballot after city officials alerted them of missing paperwork today. Organizers of the rent control ballot initiative are working with their attorneys to draft an ordinance to re-submit their petition and they hope to do that within the next 24 hours, according to one of the petition organizers. City Attorney Charles Parkin confirmed that the filing was incomplete, saying it failed to include a proposed ordinance. Once the application is submitted and approved, organizers will have 180 days to collect the signatures needed to put it on the ballot. 11/8/17 at 5:26PM | Housing advocates in Long Beach successfully filed paperwork at City Hall today to begin a ballot initiative process that, if successful, will leave it up to voters in 2018 to decide whether the city made up of about 60 percent renters should have rent control. What Housing Long Beach and allied organizations ultimately want is to establish a rent control ordinance in the city that would set what maximum allowable rent increases would be as well as establish a just cause for eviction, according to HLB’s Executive Director Josh Butler. It would also establish a rent board that would be involved in making decisions associated with lowering or increasing rent, he said. After seeing cities up and down the state proposing similar ballots to voters, Butler said the time felt right to act on issues housing advocates have been working on for a very long time. “The longer we wait the threat of displacement continues to hang over people’s heads and I think as the city undergoes the changes that it’s going through the residents deserve to know that they have some security and that they can be part of the change taking place as well,” Butler said. Housing advocates demonstrate outside city hall. 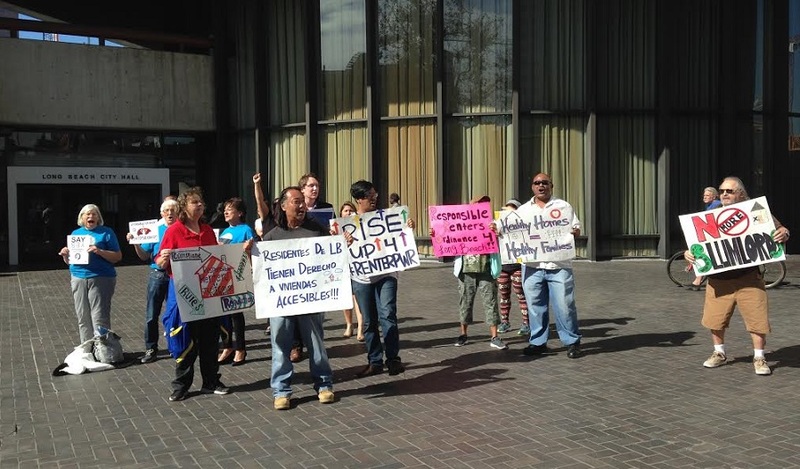 Over a dozen supporters gathered at city hall just before noon, waving signs in English and Spanish that read: Healthy Homes = Healthy Families and Residentes De LB Tienen Derecho A Viviendas Accesibles! (Long Beach residents have a right to affordable housing). One of the proponents who has signed on with Housing Long Beach is Latinos In Action President Martha Cota whose rent was increased November 1 from $1,100 to $1,400, according to Butler. The increase was done with no improvements to the unit. Karen Reside, 67, has heard similar stories from friends who’ve had their rents raised $350 to $500. “And it’s to push them out so that people that buy the building come in, renovate and charge double, triple the rents that they’re currently getting for the buildings,” Reside claimed. She also has another friend who is at risk of being evicted after he led a demonstration at his affordable housing building because management only gave the senior tenants five days to move out of their units to prepare for bed bug treatment. A part-time employee at the Long Beach Senior Citizens Center and a secretary for the local senior advocacy group the Long Beach Gray Panthers, Reside said she has been working on affordable housing issues for over a decade. “I live in an affordable housing unit and if I didn’t have affordable housing I wouldn’t be able to live in Long Beach,” she said. Housing advocates cheer on inside City Hall as Butler finishes filing the paperwork needed to beign a ballot initiative. Ultimately, Reside says everyone is entitled to have a place to live in. In order for the proposed initiative to appear on the November 2018 ballot, advocates next need to present a petition with about 24,000 valid signatures, equal to 10 percent of the total registered voters in Long Beach, according to the city clerk’s office.